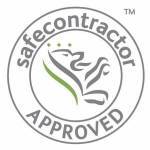 ND Brown Ltd are delighted to announce the award of ‘safecontractor approval’. Please see our press release below. Top Safety Accreditation for ND Brown Ltd.
Local business ND Brown Ltd has been awarded accreditation from safecontractor for its commitment to achieving excellence in health and safety. Employing 35 people, ND Brown Ltd is principally involved in the Commercial Vehicle Rental sector, specialising in the Road Repair and Utilities industries and with a £7 million turnover. ND Brown’s most recent clients have included significant players such as Major Infrastructure Companies, Highways Authorities and many County and Borough Councils. ND Brown Ltd are market leaders in Safe Working practices and techniques for the specific vehicle types available that they offer either as for Hire or for Sale. “More companies need to understand the importance of adopting good risk management in the way that ND Brown Ltd has done. The firm’s high standard has set an example which hopefully will be followed by other companies within the sector”.